On April 19, 2017, Dr. Rasheed Alhammadi, Curriculum Director of Ministry of Education of United Arab Emirates (UAE) who visited Japan in attendance on Foreign Minister H. H. Sheikh Abdullah, and Education Minister H.E. 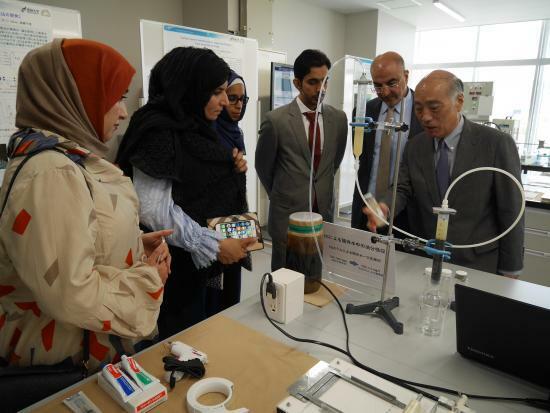 Hussain Ibrahim Al Hammadi, visited Global Aqua Innovation Center at Shinshu University (AICS) to see the effort of Global Aqua Innovation Center Project (COI). 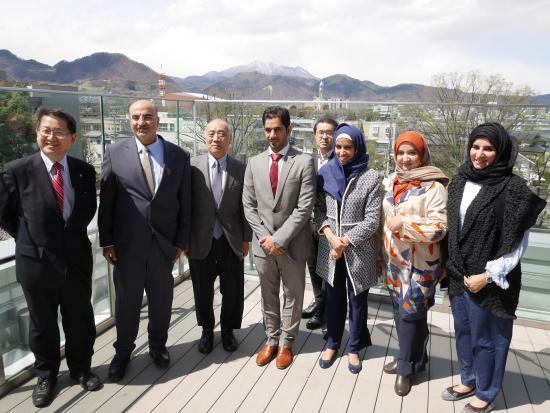 This visit was realized with the advice of Khaled Alameri, UAE Ambassador to Japan, who visited AICS on March 7. It is expected that the negotiations for receiving students from UAE and collaborative research will be smoothly made in the future. In addition to Dr. Rasheed Alhammadi, the visiting party included Mr. Hamdan Al Saedi (Director of Environment, Health and Safety Directorate), Ms. Fathiya Al Shehhi (Cluster Manager), Ms. Ameena Al Aleeli, Ms. Noor Belhoul (Strategy and Future Department), Ms. Sumiyo Shinagawa (who is in charge of culture and education of UAE Embassy in Japan). These six were met and greeted by attendants from Shinshu University, including Vice President Kiyoshi Tanaka (Director of Global Education Center who is in charge of international affairs), Distinguished Professor Morinobu Endo (COI research leader), Associate Professor Kenji Takeuchi (COI sub research leader). When the party arrived at Nagano-Engineering Campus, they were deeply impressed by cherry blossoms in full bloom near the main gate, and went to the Oval Studio on the second floor of AICS. Following an opening address by Vice President Tanaka, Dr. Rasheed Alhammadi mentioned the possibility of cooperation with Ministry of Education through the Innovation Program directly under the prime minister, Incubation Center of UAE University, Aqua COE, and He expressed "I hope that this visit will be more fruitful for mutual collaboration." Following the explanation of Dr. Endo, They were invited to the COI Laboratory tour on 7th floor of AICS. Lunch meeting was also held and it was a valuable opportunity for exchange.